Skateboarding used to be a very popular genre in gaming, with Activision’s Tony Hawk series and EA’s Skate at the forefront of its popularity. However Tony Hawk eventually saw the quality of the series fall away along with its popularity, and sales have diminished to the point that the series has fallen off the radar, along with EA’s attempt at the genre, Skate. 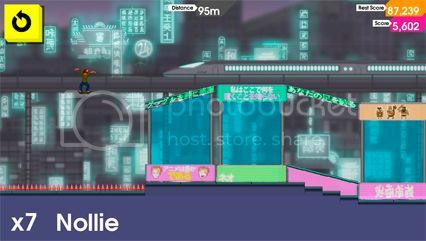 OlliOlli is a side scrolling skater game that is crossed with a platformer, but can this little indie game from Roll7 really breathe new life into a struggling genre? Grinding and spending time in the air helps rack up the points. OlliOlli looks like a simplistic game, with its 2D side-scrolling perspective and pixellated art style graphics, but the game is surprisingly deep, with loads of tricks and grinds to perform. The trick system works very well, with the left stick being used for tricks, flips and grinds. You hold the left stick in different directions, or twist it and let go to start a jump, with the shoulder buttons used to tweak the spins and turn a bog standard ollie into a fantastic death-defying combo. Once you’ve pulled off these combos you need to land as well as possible by hitting the X button when you’re just about to land. You’re rated on how you land from sloppy and sick to perfect, and this score is combined with your combo multiplier that will give you a final score. It works well, although the small sticks on the Vita combined with the cramped button layout make pulling off the tricks you want difficult by accident rather than design. Grinding on a helicopter’s blades is not something for the faint hearted! OlliOlli is a tough but fair game, that can be frustrating at times, but not to the point that you inflict any abuse on your Vita. When you fail, the game takes you back to the start of the level quickly, and as each level only takes a minute or so to complete, having to restart from scratch isn’t too much of an inconvenience. With 120 tricks and grinds to learn there is plenty for players to get their teeth into which adds to the replayability, although we couldn’t really see that each trick differed from the last that much; but that could be because we were concentrating on staying airborne for as long as possible. In actual fact the main crux of the game is to stay in the air, or grind the rails, for as long as possible. This gives you the highest scoring combos, so trying to avoid landing for as long as possible is the best way to get a top score. Once you land the combo points that you accrued are banked, and the combo ends. With this in mind, it’s beneficial to try and memorise each of the levels, and plot your path through them. The neon lights of Tokyo bring back memories of Jet Set Radio. 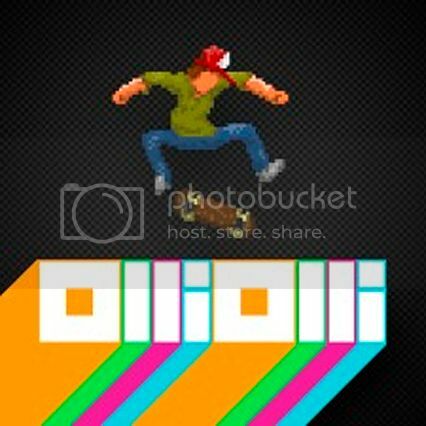 OlliOlli has that ‘one more go’ appeal to it, with you trying to beat your best score and to complete each of the five challenges on each level. 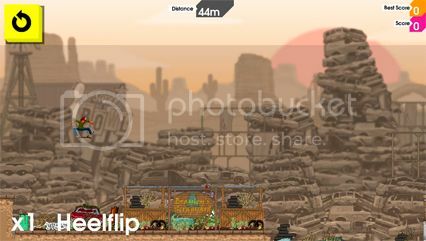 These include getting to a certain score, collecting items that are strewn across the level, or landing perfect tricks. Completing these challenges give you stars, and when completed they open up the Pro version of the levels, which cranks up the difficulty. 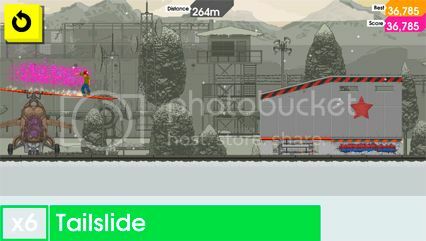 There are five levels in OlliOlli, which each have five amateur runs, and another five Pro levels to unlock. On top of this the game has a Spot mode, which has you trying to get a top score in a confined area, and a Daily Grind mode, which you are only allowed to tackle once, and which is replaced with a new level every 24 hours. You can practice the run before you give it a go, but after you’ve played it for real, whatever score you achieve is the final score that gets uploaded to the leaderboard. The leaderboards in the game are quite basic though, and only tell you where you are in the world rankings, with no way to compare your scores with your friends, which is disappointing. Having bragging rights over your mates would have been a great way to up the competitive stakes, and help push you even harder to get a top score. Just as Matt Smith in his stint as Doctor Who made bow ties cool, OlliOlli makes skateboarding cool in gaming again. Its fusion of skating and platforming is a good combination, and there is plenty of depth to the gameplay that keeps you pushing to get better. The ‘one more go’ addiction is strong in OlliOlli, even though you can get frustrated if you keep crashing at the same point in a level multiple times, but it never feels unfair, and the game keeps pulling you back time after time. OlliOlli is a refreshing take on an ailing genre, which also breathes new life into the struggling Vita.